Stop closing on-topic questions just for mentioning another distro! Just out off top of my head for the last time, here's one, OP simply stated distros they tried — Fedora, Fedora again, Ubuntu, etc — the question is closed. Later then they diplicated the question by simply removing the list, and — oh, surprise! — now it's on-topic! It went even worse for this one. "It was edited" — you'd say — "I'm sure the horrible mess was here in the 1-st revision!". Well, let's look at it: "I've been using Fedora'n'Ubuntu… blahblah… crashes, frozen… blahblah… Ubuntu again…". They mentioned the word Fedora a single time, and got 4 (four!) downvotes, and the question closed for no reason — are you serious? The first question is off-topic because OP is asking for a "distribution compatible with MSI ACPI" and has already ruled out Ubuntu. This would mean any suggestion we give is not Ubuntu and therefore off-topic. The question that you claim is a duplicate of the first question is phrased differently: the OP now wants to "do something to be able to use [U]buntu with MSI ACPI". This is now on-topic because it is in fact about Ubuntu. 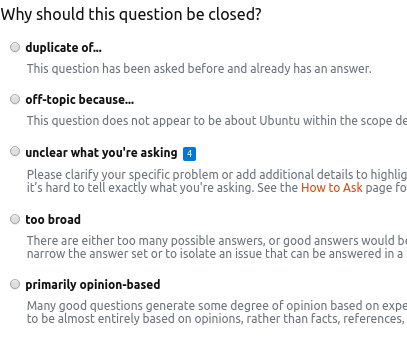 I agree the second question should not be closed as being off-topic. It would still probably be closed as being unclear because we need more information to suggest solutions. Note: Mark Kirby has made an edit to the first question and included the phrase "or can I get Ubuntu working? ", so that would make the first question on topic now. Therefore, the followup question has become a dupe. Check the comments below the question: typically high-reputation users who have been here for a while leave a comment explaining what's wrong with the question. Flag for moderator attention. Explain clearly why you think the question should remain open. Leave a comment under the question requesting users to retract the close votes. Don't show attitude just because a question is closed. Abide by Ubuntu Code of Conduct and be nice to others. Really, it's not the end of the world if a question is closed. Listen to what other users have to say and their reasoning for closing the question. The rules for accepting a question are quite strict so that the community can keep up with the waterfall of unrelated questions. It is keeping that focus that keeps us going. If you spot questions like the ones you spotted (which, I think were correctly closed and later marked as dupe), can you please leave a comment on the question itself? That pushes the reviewers to view your perspective. Or can you push the person asking the question to rephrase it so as to make it relevant? I know you are trying to do the right thing, and almost all of us have been at that point (in your words: 'are you serious? ').